Features Slideshow, Top Navigation Bar, Custom Menu, Fixed Width, 3 Column, Bookmark Ready, Auto Readmore, Games, Elegant, Magazine, News, White, Ads Ready, Free Premium etc. 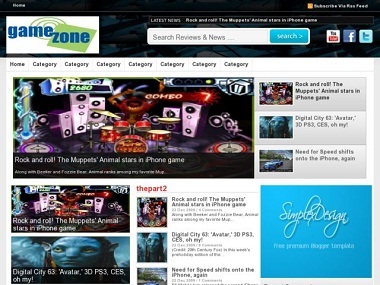 Simplex GameZone Blogger Template is a free premium blogger template regarding Games. This template has been developed by The Simple Design and its one of their best creations. This template is adapted from WordPress. Simplex GameZone is suitable for all types of blogs but is the best for Game Blogs. Add the url of your social networks to this code . Add link to categories to menu code above . Do the same for thepart1, thepart2, thepart3, latestupdate widgets . Add the ad code into widget content. There's many place which you can add widget in this template . You can add/remove them as you want. Save changes. OK ,you are done .